In late February 2019, you can see all five bright planets, two after sunset and three before sunrise. By bright planet, we mean any solar system planet that’s easily visible without optical aid and that’s been watched by our ancestors since time immemorial. 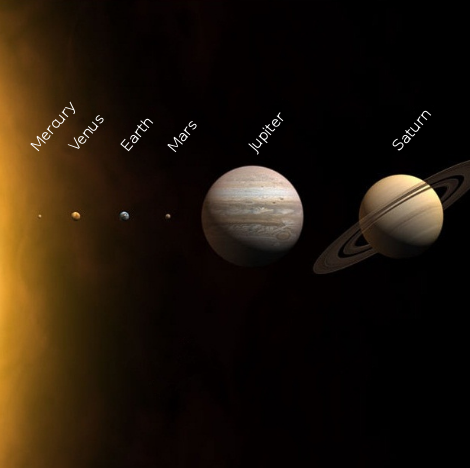 In their outward order from the sun, the five bright planets are Mercury, Venus, Mars, Jupiter and Saturn. And they really are bright and noticeable in Earth’s sky! The illustration above – which is from NASA – shows the five bright planets, plus Earth, in their order outward from the sun. Their relative sizes are correct in this illustration, but – in real outer space – their relative distances from one another are much more vast. Spot the two evening planets – Mercury and Mars – in the west not long after the sun goes down. 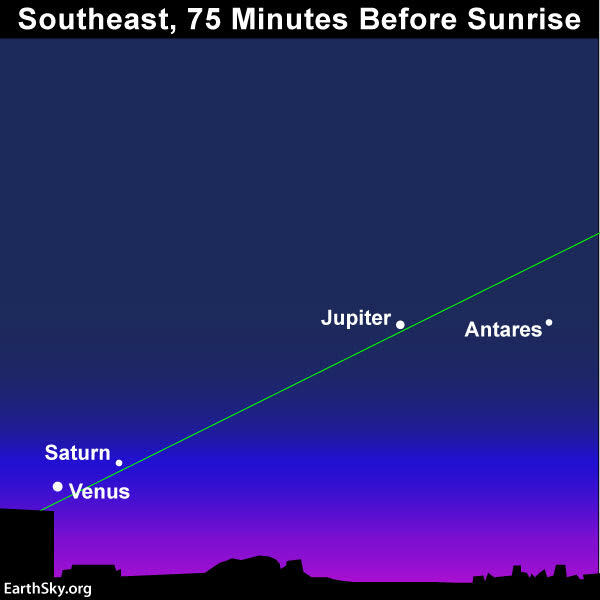 Then see the three morning planets – Jupiter, Saturn and Venus – inthe east before daybreak. Mercury becomes visible in the second half of February 2019, beneath Mars in the west, as evening twilight gives way to nightfall. Mercury is bright, but it loses its luster in the twilight sky. Binoculars might come in handy. Read more. Venus, the brightest planet, and Jupiter, the 2nd-brightest, are beautiful and easy to see. Saturn, though not nearly as bright as Venus or Jupiter, is made easier to see now by its proximity to Venus before dawn. Of the five planets, the biggest challenge by far is Mercury. From most places worldwide, this world will follow the sun beneath the horizon before it gets good and dark. To maximize your chances of catching the solar system’s innermost planet, find an unobstructed horizon in the direction of sunset. Then look for this world near the sunset point on the horizon as dusk gives way to darkness. At mid-northern latitudes, Mercury sets about 90 minutes after sunset. Farther north, such as in Alaska, Mercury sets a whopping two hours (or more) after sundown. At more southerly latitudes, Mercury sets sooner after the sun. At the equator (0 degrees latitude), Mercury sets about one hour after sunset, whereas at temperate latitudes in the Southern Hemisphere, it’s more like 40 minutes after the sun. Click here for a sky almanac telling you Mercury’s setting time in your sky. Read more: Have you seen Mercury yet? 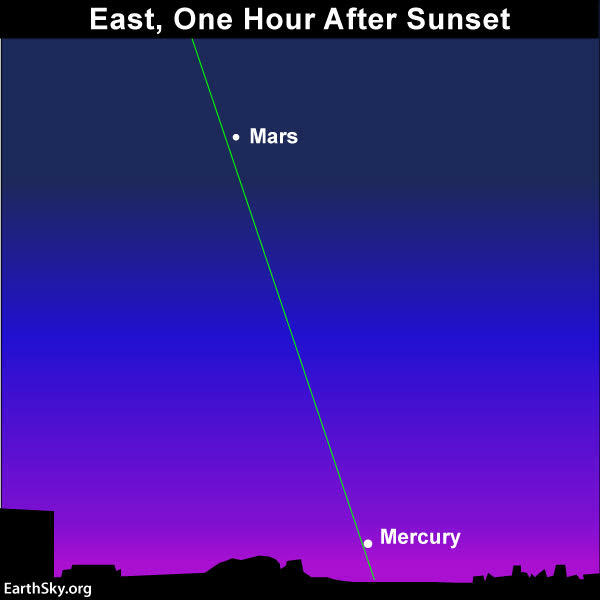 Unlike Mercury, Mars makes a good appearance in the evening sky from both the Northern and Southern Hemispheres (except at far southern latitudes, such as Antarctica). Although the red planet isn’t as bright as Mercury in February 2019, Mars is bright enough to be easily visible in a dark sky. Fortunately, Mars will be out until late evening at mid-northern latitudes; at temperate latitudes in the Southern Hemisphere, Mars stays out until mid-evening. Look for Mars in the western sky as darkness falls. The morning planets are even easier to view. All three morning planets – Jupiter, Saturn and Venus – will be up before dawn from virtually everywhere worldwide (except at far northerly latitudes, like Alaska, where Venus will rise about an hour before sunrise). However, Venus and Jupiter rank as the third-brightest and fourth-brightest celestial bodies, respectively, after the sun and moon. Both Venus and Jupiter should be dazzling bright, even at morning dawn. Saturn, the dimmest of these three morning planets, is still as bright as a 1st-magnitude star. Saturn might be hard to make out in the glow of dawn, but it’ll be easy to spot in the predawn sky, or about 90 minutes before sunrise. 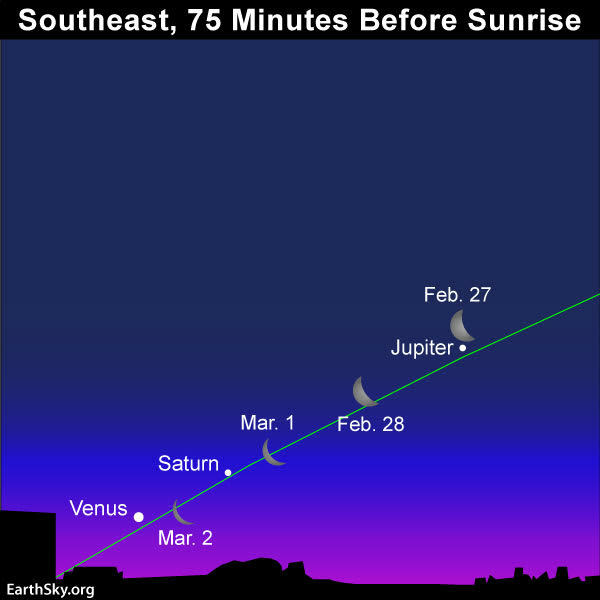 In late February, the line-up of morning planets showcases Jupiter at top and Venus at bottom, with Saturn in between the two. If you can’t see Saturn with the eye alone, try your luck with binoculars. And be sure to keep watching before sunup. By the last few days of February, and first few days of March, the moon will be sweeping past the planets. In late February and early March, watch the moon go by Jupiter, Saturn and Venus. Read more. Bottom line: All 5 bright planets are in grand display in the February 2019 sky. Look for Mercury and Mars in the west after sunset; look for Jupiter, Saturn and Venus in the east before daybreak. Good luck, and may you be blessed with clear skies!